We won’t have online entries for the swim on Friday as the Active system seems to have given up on us. So, if you do want to enter, you can print off the Entry Form, fill it in and return it to us as soon as possible. You can scan it and email it back to blackwaterswim@gmail.com or send it in the post to Owen O’Keefe, 3 Springfield, Fermoy, Co. Cork, Ireland. We will accept entry fees (not entries, these must be done as just outlined) at registration. Some good news though, we’ve reduced the entry fees to €15 for the 18+ age group and €10 for the <18 age group. Those who have paid the original entry fee already will be refunded at registration. Also, the water temperature is up, hooray! Check-in at Fermoy Rowing Club from 18:00 to 19:00. Safety briefing for all swimmers at the same location at 19:05. Swim start at 19:30 from the new slipway. Refreshments and prizes upstairs straight after the swim. Hello, everyone! At last, entries for this year’s race are now open. Unfortunately, however, Active.com are a little slow in listing our event this year and, as a result, we are only accepting paper entries for the moment. All information about how to enter for the swim can be found on our Entry page and the entry form and parental consent form can be found there also. That’s it from us for now, keep an eye on the site for further information! Greetings, swimmers! We put a start to this year’s posts with a date for your diaries… The Martin Duggan Memorial Swim for this year will be held on the evening of Friday, 6 June 2014. Keep an eye on this site and on our Facebook page for more information. This year’s Martin Duggan Memorial Swim was held at 7:30 pm yesterday evening in the River Blackwater, Fermoy. Although the weather was pretty damp for most of the day, it cleared just before the swim and we had much nicer weather conditions than we had been expecting earlier on. The rain didn’t raise the level of the river and so swimmers were able to make good progress against the current over the first kilometre. According to the thermometer on Carol Cashell‘s watch, the water temperature was 14.3ºC. Nobody had any complaints and it was clear that everyone really enjoyed their swims. All of the 47 swimmers that started the swim finished. 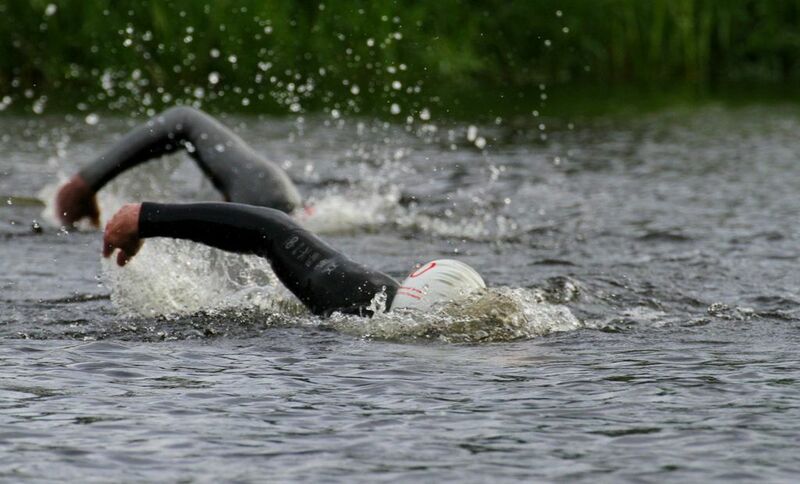 Two swimmers coming around the turn buoys at the top of the course (Photograph: Lee Fox). 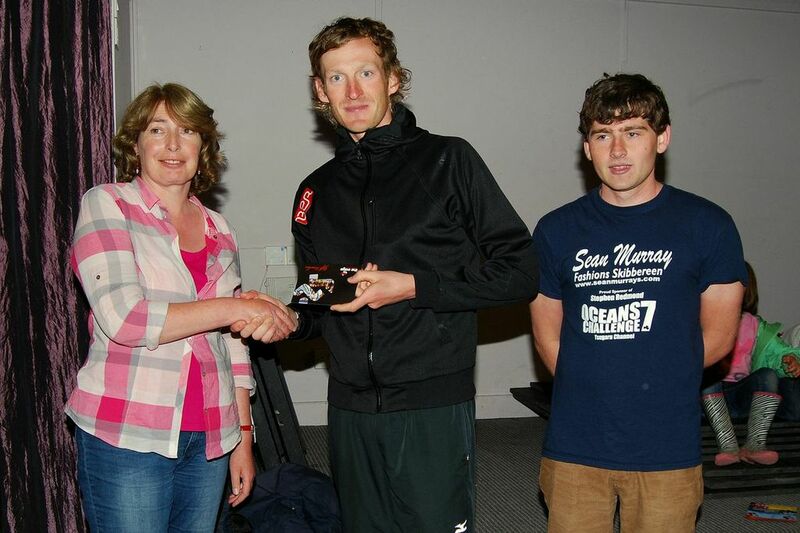 Irish elite triathlete Gavin Noble (Sandycove Island SC) took first place. He swam the 2 km course in a new record of 23 minutes 32.7 seconds! Fellow top athlete and a past swimmer on this course Bryan Keane (Templeogue SC) wasn’t far behind him. He finished in 23 minutes 50.1 seconds. Owen O’Keefe (Fermoy SC) was the first non-wetsuited swimmer to finish but Ned Denison (Sandycove Island SC) took the prize for that place as Owen is on the Organising Committee of the event. Sarah Early (Templeogue SC) was the first female to finish. Carol Cashell (Dolphin SC) was the fastest non-wetsuited female. She took part in yesterday’s event hardly a week after swimming around Manhattan Island, New York! Full results can be seen on the Results 2013 page. If you spot any mistakes please let us know and we’ll try to rectify them as soon as possible. Gavin Noble accepting his prize – a €25 voucher for The Edge Sports in Cork – from Brigid Noonan and Owen O’Keefe (Photograph: George O’Keefe). 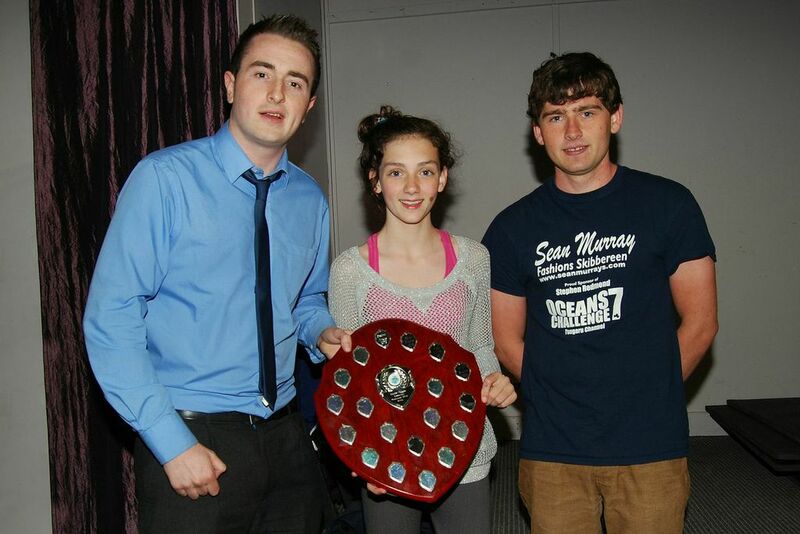 Each year, the Martin Duggan Memorial Shield is awarded to the youngest swimmer to complete the swim. It came as no great surprise that Mary Brooks (Fermoy SC) was this year’s recipient. Mary received the prize having completed the 2 km course in a very fast time of 32 minutes 39.1 seconds (with a wetsuit). Mary is the third of the Brooks siblings to have won this prize! Mary Brooks accepting her prize – Martin Duggan Memorial Shield – from John Duggan and Owen O’Keefe (Photograph: George O’Keefe). Many thanks are due with regard to the organising of this event. First and foremost, we’d like to thanks everyone from Fermoy Rowing Club for allowing full use of their facilities and giving us so much help on the day – we couldn’t hold the event without them. We must also thank Blackwater Sub-Aqua Club, all of our kayakers and onshore spotters, who helped provide a safe event for swimmers. A big thanks to our referee, Jim Sheehan, who kept everything running very smoothly, our timekeepers, our turn judges and our photo-finish cameraman, George O’Keefe. Thanks to “The Edge Sports”, Cork for sponsoring four €25 vouchers for their store. Finally, we’d like to thank everyone that made sandwiches, cakes and refreshments of all sorts and Noel McCarthy, “Carry Out” off-licence, Fermoy for giving us the soft drinks. There’ll be plenty of photographs up on our Facebook page pretty soon (tomorrow or Monday). For now, thanks to everyone for coming yesterday, we’re very glad that you enjoyed it and we look forward to seeing you again next year! If you have entered and do not see your name on the above list please send us an email or give us a call as soon as possible. Don’t forget that the registration desk will be open from 6:00 pm until 7:00 pm upstairs in the Rowing Club and that all swimmers must register within these times. Today is the final day for entries for this year’s Martin Duggan Memorial Swim. The entry system will close at midnight tonight and we will not be able to accept any late entries or any entries on the day. This policy is adhered to for safety reasons. Tomorrow, the starting list will be published on this website and you’ll be able to have a good look at the range of participants for Friday, especially those in your own speed bracket! Instructions for swimmers and volunteers will also be issued. We’re looking forward to seeing you all on Friday!